I have drawn attention to the welcome three-year decline in the size of U.S. prison population. Because a huge state with a huge prison population (California) recently began a historic realignment of corrections from the state to county level, some skeptics have worried that the apparent positive news about prisons is an illusion borne of a shell game, i.e., As many people as ever are behind bars, they’ve just been moved from state prisons to local jails. A new report by the Bureau of Justice Statistics (BJS) provides the means to assess whether this gloomy hypothesis is correct. 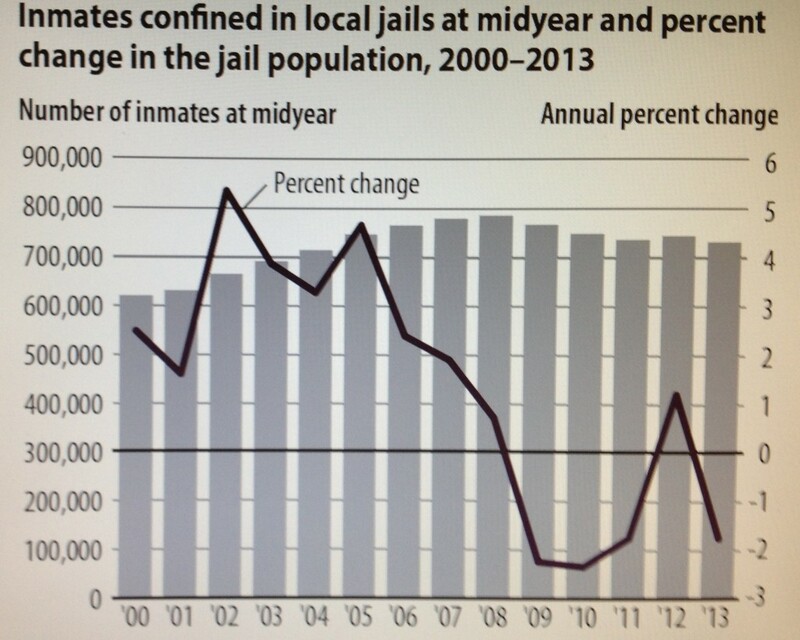 As the chart shows, the number of people in jail began declining around the same time as did the number of people in state and federal prisons. The BJS estimates that about 54,000 fewer people were in jail in mid-year 2013 versus mid-year 2008. This is despite California’s realignment policy, which caused the Golden State’s jail population to rise rapidly by 11,100 inmates between mid-2011 and mid-2013. For 2012, during which 2/3 of this spike in growth occurred, the California increase was so large that it pushed the change in the national jail population from negative to positive. But the broad national move towards de-incarceration overwhelmed even California’s jail growth by 2013, returning the country to the path of reducing the jail population. Analyses of the recent decline in the number of inmates which have focused just on prisons (e.g., mine) have thus understated rather than overstated the trend toward de-incarceration in the U.S.
Next Next post: Anti-intellectualism in libertarian policy?